In Vasithasana (Side-Plank) some teachers have told me to stack my bottom arm directly under my shoulder. Other teachers have told me to step my hand in front of my shoulder. What is the safest, most effective alignment for the bottom arm in this posture? I used to be a diehard stacker. And, for what it’s worth, I lived to tell about it. So, if you’re a stacker, you shouldn’t lose sleep over my answer to this question—there’s hope for you, too. 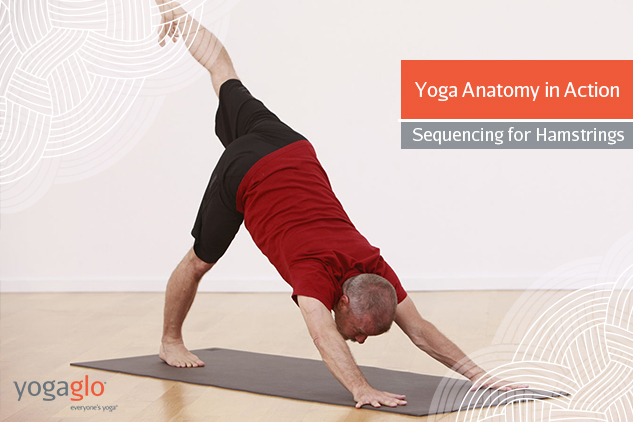 My position changed when I started working with Paul Roache, MD on our Essential Anatomy program for YogaGlo. Paul is board certified in both Orthopaedic Surgery and Sports Medicine. He’s a shoulder specialist and he took me aside after class one day to talk about this very issue. It took him less than 30 seconds to show me why taking my hand slightly in front of my shoulder was a more dynamic and sustainable choice than stacking my bottom arm. In simple terms, the body makes two lines in Side Plank. One line runs from the shoulder to the bottom hand. The second line runs from your feet through your legs, torso and upper body. This second line is not parallel to the floor—it’s sloped at about 20-30 degrees (see photos below). This means that if you stack your bottom arm directly under your shoulder you are creating less than a 90-degree angle in your ball and socket joint since a sloped line and a vertical line don’t form 90-degrees when they intersect. In this situation they form about a 60-70 degree angle and this is a less effective angle for weight bearing in this posture. In order to create a 90-degree angle in your ball and socket joint, you need to move your bottom hand slightly forward of your shoulder. If you have one sloped line and you want to create a 90-degree angle, you need an equivalent slope in your other line. This means that the bottom arm should be staggered slightly forward of the shoulder joint, not placed directly underneath it. -The 90-degree angle limits wear and tear by distributing the stress of the posture more evenly throughout the ball and socket (your Glenohumeral joint). -The 90 degree angle helps you engage the external rotators of your upper-arm (Infraspinatus, Teres Minor, Supraspinatus) and decreases the likelihood that your Humerus bone will rotate forward and down. This takes tension off the front of your shoulder joint, especially in more advanced versions of the posture. This may help minimize the potential for Rotator Cuff strain in the posture. -The 90 degree angle helps you engage your Serratus Anterior, Lattisumus Dorsi and lower-fibers of the Trapezius muscle. When you fire these muscles, you draw your shoulder away from your ear and support the posture from your upper back. This decreases stress on the front of your shoulder. 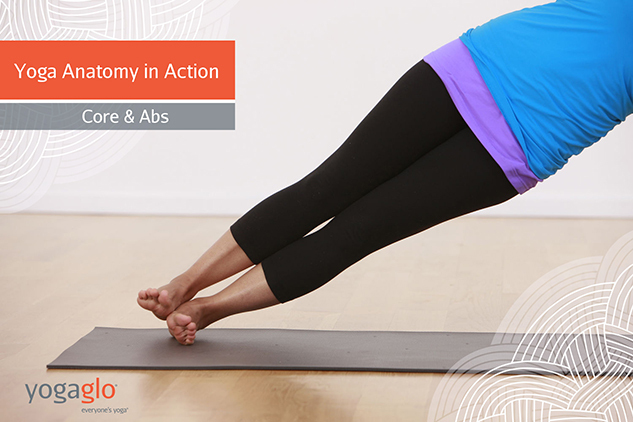 -The 90 degree angle requires you to use your core more. In the short term, this may make the posture more challenging, especially if you’re used to sinking your weight down on the arm and loading the front of your shoulder. In the long run, using your core more will strengthen your midsection—especially your Quadratus Lumborum—and take pressure off your bottom shoulder joint. Warrior 2 provides you with an opportunity to feel the action of externally rotating your arms without bearing weight on them. Once in Warrior 2, rotate your palms and elbow creases toward the ceiling. Feel your arms externally rotate so that you can reconnect to this sensation when you’re in Side Plank. Triangle pose provides another opportunity to externally rotate your arms while warming up the rest of your body for Side Plank. In the posture, focus on rotating your bottom elbow crease toward the front of your mat and drawing your shoulder blades away from you ears. The arms in Down Dog and Side Plank are in different positions, but they’re creating similar actions. Try this: From Down Dog, bring your shoulders slightly forward toward plank. Rotate your inner elbows slightly forward and feel the engagement of your external rotators, deep inside your shoulders. Maintain this engagement and slowly draw back into Down Dog. From Plank Pose with your arms stacked, roll to the outside of your right foot. Place your left leg on top of your right leg and reach your top arm toward the ceiling. Take a few breaths before returning to plank. Start in Down Dog. Bring your shoulders slightly forward toward plank. Step your right hand slightly forward—about 3 to 6 inches. Externally rotate you bottom arm, roll onto the outside of your right foot and stack your top leg on top of your bottom leg. Press the floor away with your bottom arm and draw your bottom shoulder blade down your back. Take a few breaths before returning to Down Dog. 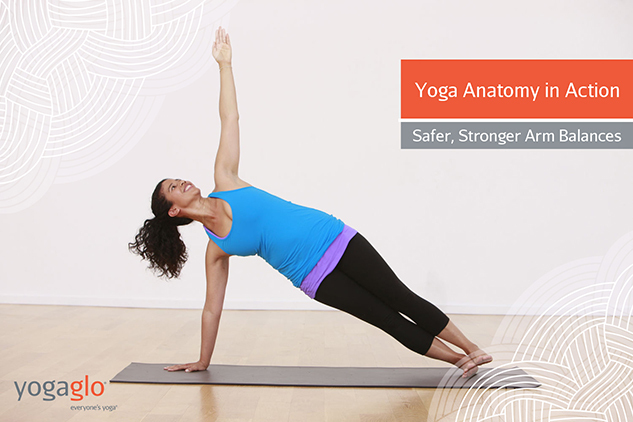 Repeat the same actions as the earlier version of Side Plank with your bottom arm stacked. Use your top arm to bring your top foot into tree pose. Take a few breaths before returning to Plank. Repeat the same actions as the earlier version of Side Plank with your bottom shoulder at a 90-degree angle. Use your top arm to bring your top foot into tree pose. Take a few breaths before returning to Down Dog.